Welcome to my award-winning and recognized spray paint art! I am Nathan Bassett and I have discovered that spray paint art is relatively unheard of except in places like Las Vegas, Mexico, etc. Spray paint art is a "live performance art" which can best be experienced LIVE as I paint a picture in about 5 minutes while playing energetic music. 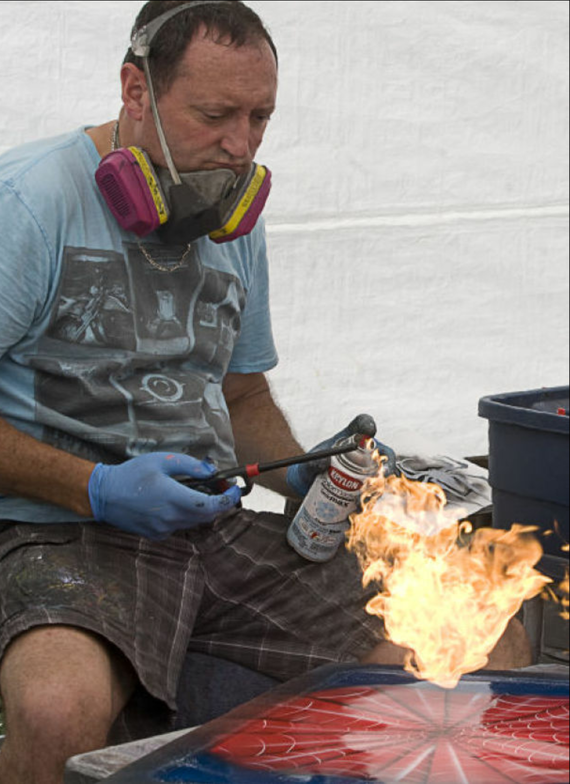 Spray paint art is NOT airbrushing. 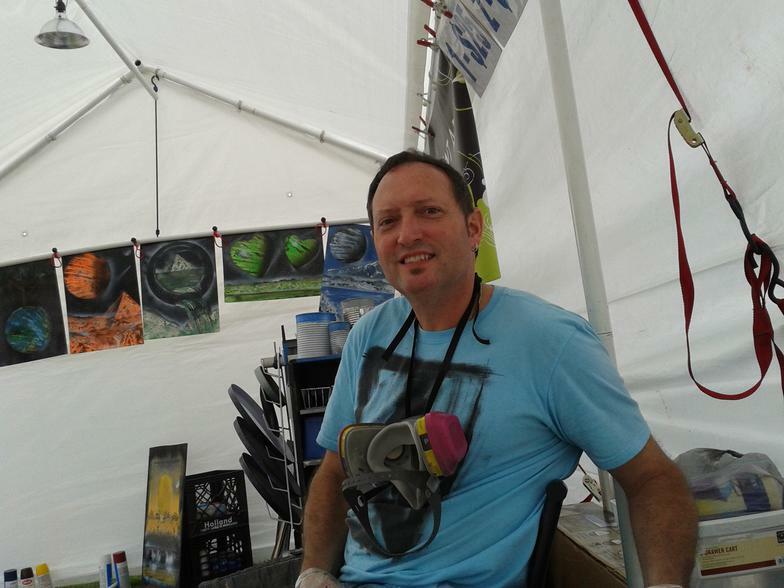 I spray paint at all outdoor shows/festivals. All my paintings are 22"x16" or 16"x22." I also will contract for special events upon request. If I happen to be at an indoor show, I do not spray paint but will have a large screen video to show the process. If I am asked to demonstrate indoors, I require ventilation. I am known as the "Spray Monay - Rattle Can Ninja of the Midwest" of the spray paint art world. I truly hope you enjoy my website and my artwork as I strive to provide a variety of paintings for you. I have been previously invited to spray paint at Auburn University (Alabama), Storm Lake University (Iowa), Eureka College (Illinois), University of Georgia (Georgia), and Illinois State University (Illinois) and I have painted in Illinois, Iowa, Indiana, Missouri, Texas, Georgia, Florida, and Canada. Click on "PICTURES/VIDEOS" to see paintings in my portfolio. There are video links at the bottom of that page to see how these pictures are "performed." I update the "CONTACT ME & SHOWS" section with news regarding upcoming Art Festivals and Shows where you can find me. Thanks for coming to my website. Stop by and see me at a show! *Nathan was featured on television on WAND-TV, Decatur, Illinois "Central Illinois A to Z." The segment was aired on Wednesday, June 10 and 11, 2009. The segment is currently unavailable since this segment is no longer in that station's programming. A picture of the event is on my "Paintings/Video Links" page. *Nathan was featured on the cover of the Summer Issue (July 2009) of "Studio Magazine," The Twin Cities [Bloomington-Normal, Illinois] Connection to the Arts & Entertainment Scene. Nathan painted a new picture for the cover and an article was also included. He was also spotlighted in a special issue released April 2, 2010. *At the 2009 Lincoln Art Fair (Arts & Balloon Festival - Lincoln, IL), Nathan was awarded the Janet Harris Memorial Award. This award is presented by the Thomas Harris Family in loving memory of their talented daughter. The award is for the artist displaying the most originality in contemporary expression and form. *At Decatur Celebration 2010, Nathan was featured by The Decatur Herald and Review (Herald-Review.com) online newspaper. That interview can be seen from the link at the bottom of his "Paintings/Videos" page. Thank you Adam Casner - H&R Videographer. *At the June 2011 QC Pridefest, Davenport Iowa, Nathan won the "Most Entertaining Booth" award. *Nathan was on the "Paula Sands Live" television show on Davenport, Iowa's KWQC TV6 in June 2012 and May 2017 where he was interviewed and spray painted a picture on live television. The 2017 interview can be seen from the link at the bottom of his "Paintings/Video Links" page. *In 2013, Nathan was interviewed for WYEC radio, Davenport, Iowa. *In 2013, Nathan was a featured guest artist at Great Day in the Country Festival in Oviedo, Florida. *In 2014, Nathan was a featured guest artist at ArtSplash Festival in Sioux City, Iowa.